Read more about electronic giving here: Electronic Giving. This very important fundraising event will be held before and after Masses Palm Sunday weekend. Funds raised by MPHM Altar and Rosary Society help to purchase altar bread and wine, candles, laundry services for liturgical linens, flowers and many other necessary supplies for the church. Donations of baked goods and raffle items can be brought before Saturday 5:00 p.m. Mass and before the 10:30 a.m. on Sunday. We will have adoration after the Holy Thursday Mass of The Lord's Supper, Thursday, April 18th at St. Joseph. As you know, we always must have someone present during adoration. The hours are 9:00-10:00 p.m., 10:00-11:00 p.m., and 11:00-12:00 midnight. A suggestion; sign up to be the guardian as an individual or family and ask others to join you for your hour. The guardian just needs to ensure that someone is present in the chapel. There is a sign-up sheet in the hall or call 419-687-4611 if you are interested. This is a great way to start the Triduum. 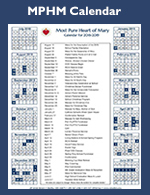 The campaign goal is $3 million and our parish goals are $27,000 for Most Pure Heart of Mary and $4,500 for St. Joseph. We can assure the continued existence of many important programs that help tens of thousands in our Diocese each year; education of our seminary students, care of the sick and needy are among them. We ask you once again for your help; we have to work together. Please respond generously when you are asked to make your pledge. Thank you for your attention and thank you for being my parish family. For more information, Toledo Diocese ACA. Save your spot for Derby Night April 26th! Enjoy the dinner prepared by Ben Lash. Bet on Horse Races in lieu of the silent auction. This is a FUN adult - only evening to support our school. We will be posting several of the live auction items to help make your plans with friends as to what you may want to share! Auctioneer Charlie Miller will be happy to watch for your bid. Just join us for Dinner - 17 tables are available. Donate a LIVE auction item? Only 12 more opportunities. We would like to start offering an adult basketball open gym on Tuesday or Thursday nights from 8:00 p.m. to 10:00 p.m. in the St. Mary School gym. 18+ only allowed. Please contact Anthony McQueen at 937-789-1967 if you are interested by April 15th. Once we have an idea of how many people want to play, we will decide on a start date. We now have a page on our parish website for cemetery information, including cemetery policies, grave pricing and maps of the cemetery layout. Click here to visit the page MPHM Cemetery. Please visit the MPHM Stock Donation page to view and downloaded the updated Stock Donation Letter of Intention and the Stock Delivery Transfer Instructions MPHM Stock Donation. The tile ceiling in the kitchen of the rectory is very loose in several places and is in need of being replaced. The project will entail removing all of the ceiling tile and putting dry wall board in its place. During this time we will also replace the wall board, add a few can lights and replace the island stove hood. The total project bid is $5,115.00. The current balance in our capital improvement fund is $4,000.00. If you would like to donate to help cover the cost of this project it would be greatly appreciated. If you have any questions about this project please contact Ken Ensman at the parish office 419-347-2381. Thank you for your consideration. The Parish Finance Council. 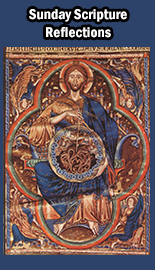 In the latest ssue of "Leading the Flock" Bishop Thomas writes: In the environment in which we live, it is ever more important to recognize and exercise the respect and dignity due to every person, no matter whether they are born or unborn, no matter whether they are healthy or physically or mentally disabled, no matter their race or ethnic origin. Why? Because Jesus Christ transcends culture and ethnic origin. Read more here: Leading the Flock. Kory Wise of Tiffin St. Joseph has just begun his journey as a seminarian. Kory is currently in the first year of his studies at The Athenaeum of Ohio, Mount St. Mary's Seminary in Cincinnati. Adopting him will allow us to follow him through the process. Please keep Kory in your prayers. Kory knows we have adopted him and is keeping us all in his prayers as well. If you have any questions, please feel free to contact anyone at the parish office. We are pleased to give you a free subscription to mphm.formed.org. Discover all the best Catholic content in one place. Entertaining movies, enlightening programs, inspiring talks, and a great selection of popular ebooks-all just a click away! Enter your email and create a password (you'll need this to login later). You're all ready to access the inspiring and engaging content on FORMED! If you would like anything posted in the church for special events, all items and information need to be brought to the Parish Office by noon on Friday before the upcoming weekend. Did you know Bishop Thomas has a weekly radio program that is also on YouTube? Follow this link to see The Bishop's Corner and other videos: Diocese of Toledo YouTube Channel. If you have a loved one or know of someone who is ill or in need of a pastoral visit with Father or someone from the Ministers of Care please contact the parish. The HIPPA Law prohibits hospitals from contacting the parish when someone is hospitalized. The office can be reached at 419-347-2381.